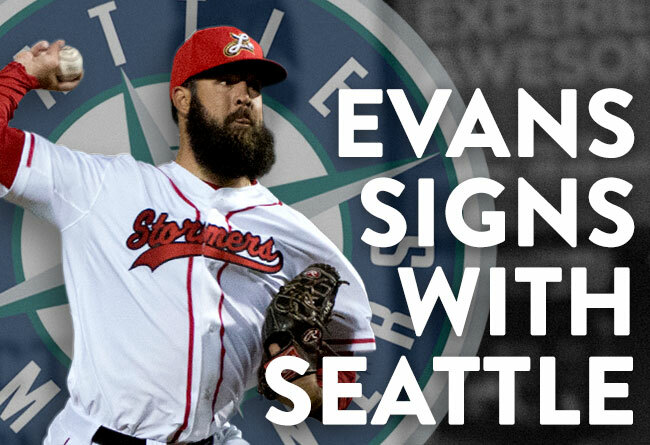 (Lancaster, Pa., Aug. 23, 2016) - The contract of right-handed pitcher Bryan Evans has been purchased by the Seattle Mariners, it has been announced by manager Butch Hobson. Evans will join the Jackson (Tenn.) Generals of the Class AA Southern League. Evans, 29, departs after setting the Barnstormers’ single season strikeout mark at 130. He also tied the single game record, fanning 13 Long Island Ducks in a two-hit shutout on August 14. The California native was Lancaster’s Opening Night starter for the second consecutive season. The right-hander was 4-9 with a 4.43 ERA in 23 appearances (22 starts) in 2016. This is the second time that the Mission Viejo, CA native’s contract has been purchased by a Major League organization. Evans went to the Colorado Rockies in 2015 after a 1-2 start with Lancaster. He was 6-5 with a 3.33 ERA for Class AA New Britain over the remainder of the 2015 season. The former Miami Marlins farmhand spent his first seven seasons in their organization, reaching Class AAA New Orleans in 2014. Evans is the eighth Barnstormers player and seventh pitcher to have his contract purchased by a Major League organization this season. Three – Phil Coke, Andrew Albers and Matt Reynolds – have advanced to play at the Major League level at some point during 2016. The Lancaster Barnstormers are entering their twelfth season as a member of the Atlantic League of Professional Baseball. Home games are played at Clipper Magazine Stadium in downtown Lancaster, Pennsylvania. Please call 717.509.HITS (4487) or visit www.LancasterBarnstormers.com for more information.